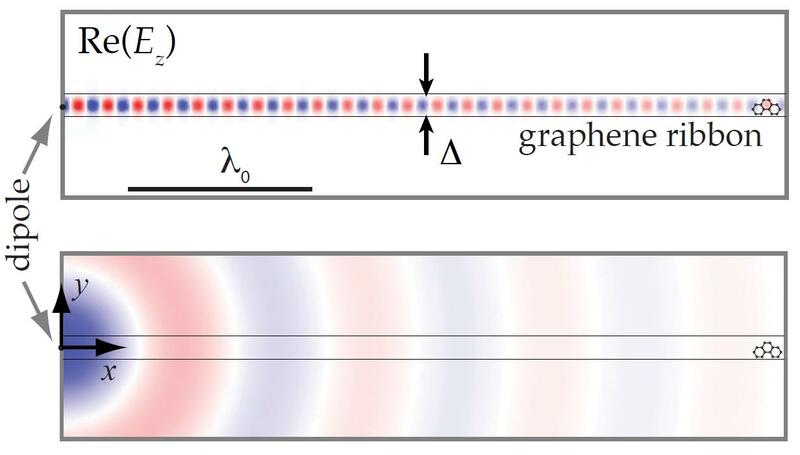 As it has been recently shown in two experimental works [1,2], a graphene sheet can support Surface Plasmon Polaritons (SPPs) . Compared to conventional SPPs in metals, the properties of graphene surface plasmons (GSP) can be tuned by means of a gate potential that modifies the conductivity of the electrons in graphene. In this informal seminar I will talk about the control of the interaction between two emitters mediated by means of the excitation of surface plasmon modes in graphene . First, I will show the emission properties of an emitter close to a graphene sheet and, in particular, the decay through GSP. Then, I will consider how GSP can be used to tailor the interaction between two emitters. When two emitters are close to a graphene sheet a superradiant state can be achieved where the collective emission is greater than the sum of the individual emissions. Remarkably, due to graphene’s properties, the interaction between the emitters can be tuned by means of a gate potential, allowing to change from subradiance to superradiance by modifying the gate. 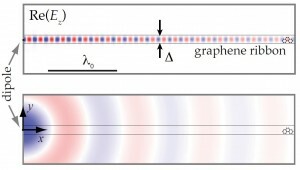 Moreover, we also study the interaction between two emitters mediated by one-dimensional graphene ribbons supporting waveguide modes , which provide a very efficient coupling between two emitters. A. H. Castro Neto, F. Guinea, N. M. R. Peres, K. S. Novoselov, and A. K. Geim, Rev. Mod. Phys. 81, 109 (2009). A. Yu. Nikitin, F. Guinea, F. J. García-Vidal, and L. Martín-Moreno, Phys. Rev. B 84, 161407(R) (2011).